Yay for new products to try! 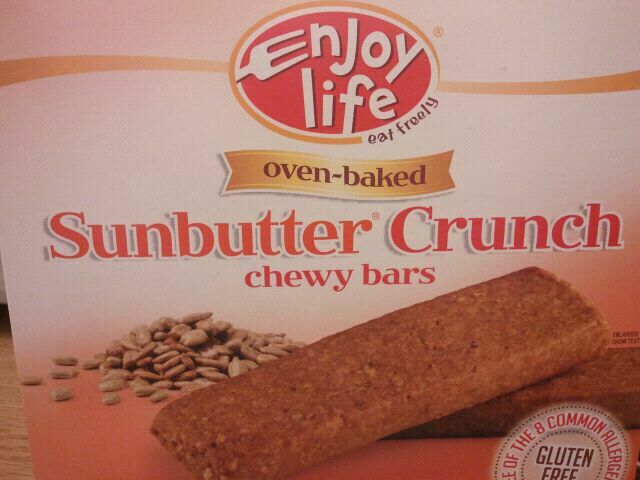 I was sent a few boxes of EnjoyLife Chewy Bars to try to review for free. Of course I agreed, as I am always up to try new things. 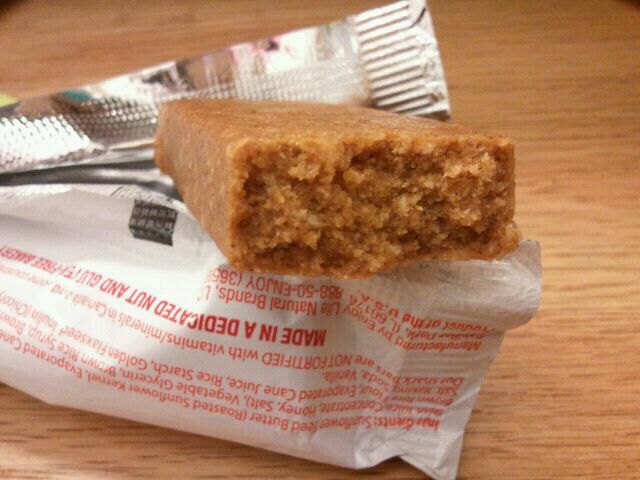 Plus….I eat granola bars like crazy! Even more…these bars are dairy free, wheat free, gluten free, fish free, egg free, soy free, and nut free! 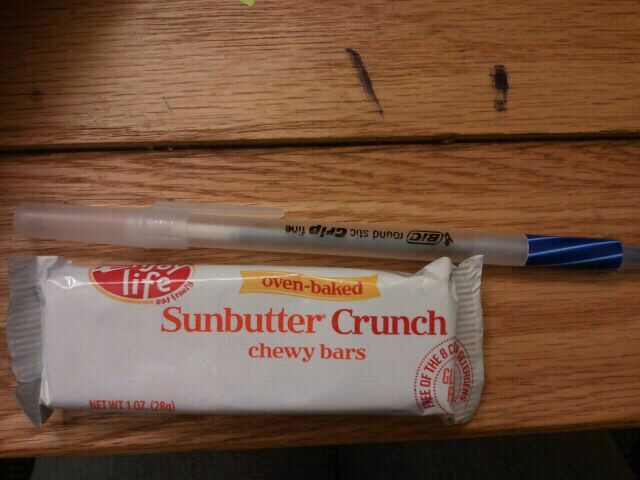 I decided to try the Sunbutter Crunch bars first. Why? I don’t know. They called to me. They reminded me of baseball games when I was little where I was given sunflower seeds to munch on. At the time I didn’t know you supposed to take the shell off. I was literally chew-chew-chewing the seeds with the shell on. HA! But anyway, I opened one up and took a look. The texture is quite weird. They feel almost rough to the touch and dry, and don’t bend well. If you bend the bar, it breaks off into pieces automatically. These smell EXACTLY like sunflower seeds. Which I suppose they should…they are made from sunflower seed butter! I broke off a piece, and it seemed like a very dense and kind of dry bar. The only way to know for sure was to take a bite. I went for it, and…I can’t say I was a HUGE fan, but I can’t say I hated it either. 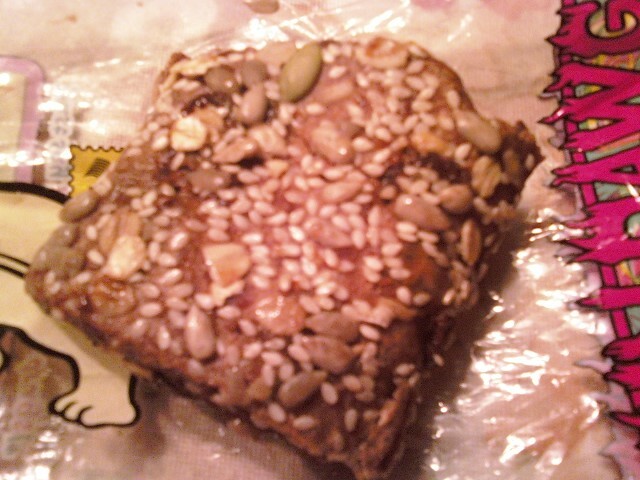 At first, it was kind of bland, and it was chewy and dense, with a puffed rice krispie texture thing going on as well. As I chewed, the bar became sweeter and sweeter. As expected, the bar was kind of dry, but not so bad where my mouth was calling water uncontrollably. These were actually kind of good! They had a mild sunflower seed taste, but tasted like peanut butter at times too (no worries- these are NUT free!!). See…tiny! But they are only 120 calories each, so I could eat one (or 1.5 of them!) before a workout as a snack and I feel like it would fuel me up just fine. Or pair one with a glass of milk! (unless you have milk allergies of course!) Overall, 3 stars. Recommended to try, especially if you like sunflower seeds! Mmmm carbs. How could anyone not like carbohydrate-rich foods? I know I may not be a “pasta person”, but I do love bread! 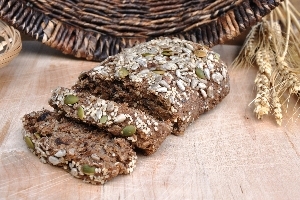 For today’s review, it’s the Fig, Fennel & Flax Manna Bread from Manna Organics. I have tried a few of them in the past, and thought they were okay, but I’m always up for trying new flavors. I was provided this loaf from Manna Organics to try for free as well. 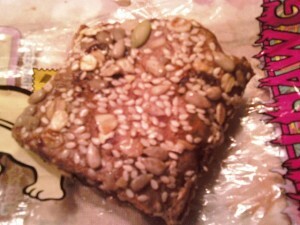 I opened up the package and saw a loaf covered in seeds- pumpkin, sunflower, poppy seeds and sesame seeds. Oddly enough, I didn’t see any flax seeds or figs (go figure). Anyway- I cut off a slice and divided it into 3. I was going to try it 3 ways.. Cold and plain- eaten this way, the bread was rather dry, bland, and had a slight poppyseed and rye bread flavor. Then, I warmed up a piece in the microwave- this way was a bit better, as some of the fig flavor came out and made it lightly sweet, and I tasted more of the seeds as well. The best method of the 3, was warming it up and putting a little bit of apple butter on it. Delicious! 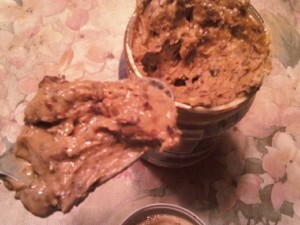 It was chewy and soft, and complemented the sweetness of the apple butter very well. Overall, I’m giving it 3 stars. 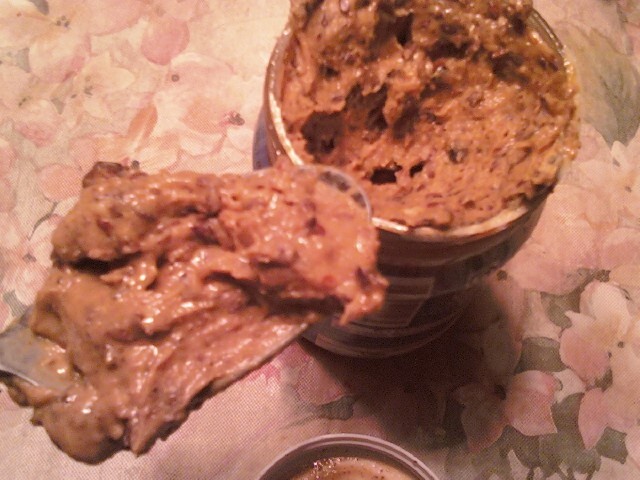 It was really only good with the apple butter on it, and I wish it had a stronger fig flavor. One thing I did like was that I didn’t detect much flaxseed flavor, a flavor I really don’t like as I think it can taste fishy sometimes. But this bread has a lot to offer. It’s organic, and according to the package, is “Free from Added Sweeteners, Salt, Yeast or Oil“. A versatile bread! 1 2 oz. slice is 120 calories, 1.5 grams of fat, 26 grams of carbohydrates, 5 grams of fiber, 8 grams of sugar, 4 grams of protein. But they really should be called sin-namon buns, now shouldn’t they? Loaded with refined flours, sugars and fat, a traditional cinnamon bun may be heavenly on your taste buds, but no so much on your heart. Enter Dave’s Killer Bread. This company managed to make the “Ultimate Sinnamon Roll”, making a 100% all natural, organic, whole grain cinnamon roll that still promises taste and satisfaction. It has no animal products, is a good source of fiber, and has 850 mg of Omega-3 per serving. So it has all the health in the right place, but, what about the taste? Well, that’s where I (and some trusty friends) come in. So let’s dig in! When I first got this in the mail, I was a bit taken aback. It was a long, bread roll, almost like a french baguette, but was absolutely COVERED with seeds and rolled oats. In fact, I’m not going to lie, this thing is ugly. Do I really want to eat this? I said to myself. See the close-up picture of a piece below, but this thing was COVERED in the seeds, which gave it an off-putting appearance (in my opinion at least). Honestly, I just don’t picture cinnamon bun + seeds/oats together- MAYBE cinnamon bun and chopped pecans- but sunflower, sesame, and pumpkin seeds? 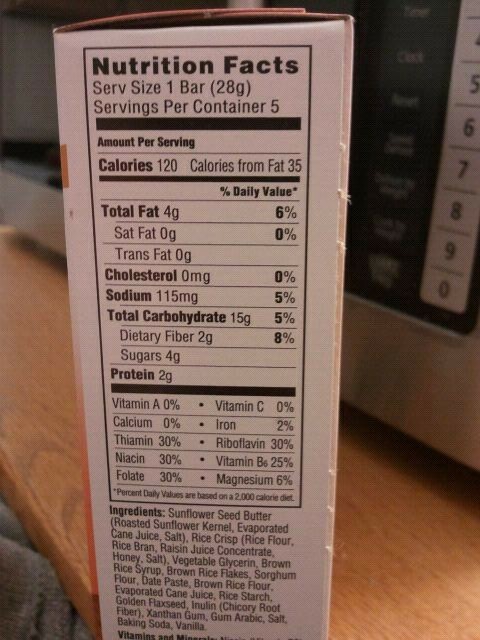 1 serving (2 oz) is 200 calories, 8 grams of fat, 31 carbohydrates, 3 grams of fiber, and 5 grams of protein. Organic whole wheat flour, organic raisins, water, organic evaporated cane juice, organic canola oil, organic molasses, organic sunflower seeds, organic flaxseed meal, organic sesame seeds, organic whole grain oats, organic wheat gluten, organic cinnamon, yeast, organic pumpkin seeds, salt, organic vanilla extract, organic rice bran extract.